A delicious, easy breakfast. I never would have thought of making scrambled eggs with curry powder, avocados and goat cheese. But I loved this and it probably will be a regular breakfast for me. Soaked garbanzo beans for 6 hours then cooked in instant pot (didn’t do an overnight soak). Followed the recipe from this point on. Tasty, made for a nice nibble with gluten free crackers before dinner. Deliciously homey and comforting chicken soup. Very good, simple chicken soup. Loved the parsnips. Very good, and a nice way to use up leftover rice and bits of cheese. Great for a late-in-the-week weeknight dinner. I used some leftover mixed grains (wild rice, brown rice, quinoa) and canned beans, and it worked fine. The dry mustard is a nice touch, livening up what could otherwise be a somewhat bland (though tasty) dish. Kate McDermott shares her everyday recipes for easy, quick and delicious meals. 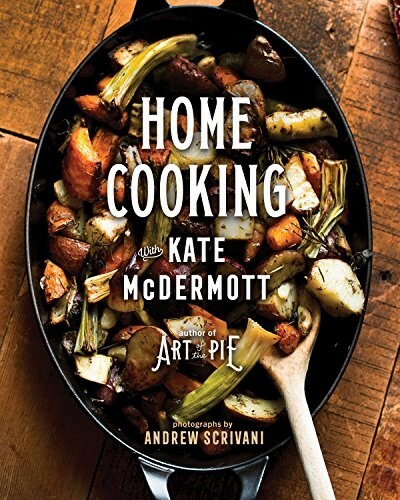 Like those in Art of the Pie, these recipes are accompanied by moving stories from anecdotes of single motherhood to building a home in the foothills of the Olympic mountains. Andrew Scrivani’s stunning photographs appear throughout.